As we’ve ruminated here before, microscale design is no mean feat. Capturing the essential details while keeping the scale compact takes a great deal of talent, and some of the most difficult features to achieve at any scale are brick-built domes. 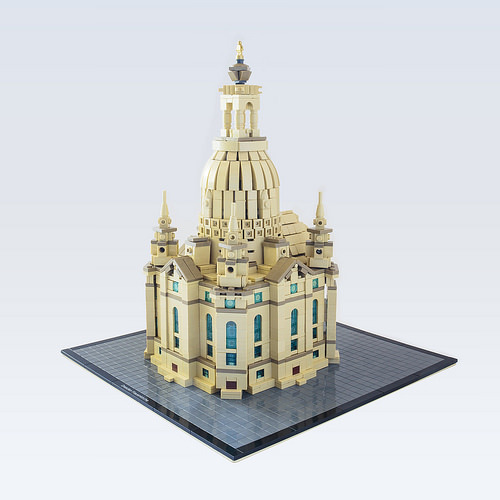 Rolli (Moriartus on flickr) has excelled at this with his miniature replica of the great Baroque sandstone edifice Frauenkirche in Dresden, Germany. The real church finished reconstruction in 2005 after being destroyed by bombing during WWII. That’s a nice study; have you ever featured Holger’s gem of that church?